Pure Life" it affords its visitors. Location: Casa Pura Vida is located approximately three miles south of the villiage of Dominical. 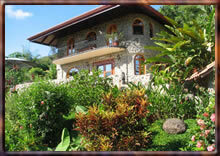 This is a private home nestled on 2 1/2 acres of rainforest with many exotic flowers and fruit trees for your pleasure. General Information: The home is situated a short way up a mountain which affords it's visitors cool breezes and spectacular views of the sea and Caños Island where Jurassic Park was filmed. The Casa is a two bedroom plus loft area, 2 1/2 bath, a balcony off both bedrooms to sit and relax or bird watch. Large fully contained kitchen and living area. A beautiful pool with hammocks to relax in and an outside bath with shower. Maid service is provided once a week. Troops of Congos, (Howler Monkeys) and White Face Monkeys are present most of the time. If you do not hear their very distinctive howl, look for swaying branches in the trees. Also look for tapirs, ant eaters, pizotes, and also a resident sloth. Two species of Tucan's share our property and appear around 4 p. m. near the pool. Additionally, Casa Pura Vida offers a guest house with a king size bed, full bath, kitchen and wireless Internet connection. 6 people can sleep comfortably between the guest house and main house, but 8 can be accommodated as well, assuming of course that the loft is acceptable for two people. A sweet outdoor security dog, named Oso, and an affectionate indoor-outdoor (your decision) cat, Lilo, both taken care of by staff. The Monkey Hideout is a smaller, 1 bedroom casita available for rent. DEPOSITS: 50% deposit at time of booking, with additional $350 security deposit, which will be refunded one week after departure from a state side bank. DEPOSIT PAYMENT OPTIONS: Wire transfer to a U.S. bank, personal check or money orders to be mailed to U.S. address or Paypal for your credit card needs! BALANCE DUE PAYMENT: Balance will be paid at time of arrival in U.S. Dollars only. CANCELLATIONS: Less than 14 days cancellation, money will not be refunded unless another booking is made for that period.